A World Junior gold medal. Two Stanley Cups with two teams. Being named captain of the Atlanta Thrashers. It might not have been the result of his own master plan, but Andrew Ladd isn't complaining one bit about how his NHL career has turned out. For as much as he had dreamed about seeing his name engraved on hockey's most coveted team trophy and for all the times he spent hoping he'd have a prosperous hockey career, there's absolutely no way, admittedly, that Ladd, the pride of Maple Ridge, British Columbia, could have ever imagined things would pan out this way. He began his junior hockey career in the Junior A British Columbia Hockey League (BCHL) with the Coquitlam Express, before moving on to the major junior ranks of the Western Hockey League (WHL) with the Calgary Hitmen, after being dealt from the Vancouver Giants for Jamison Orr. Ladd recorded 75 points in his rookie season, tops among first-year players, putting him 15th overall in league scoring. His plus/minus rating of plus-39 led the WHL, earning him the WHL Plus-Minus Award. In the off-season, he was selected in the first round, 4th overall by the Carolina Hurricanes in the 2004 NHL Entry Draft. He turned pro after two seasons with the Hitmen in 2005–06, joining the Lowell Lock Monsters, the Hurricanes' American Hockey League (AHL) affiliate. Called up to the Hurricanes in November, Ladd skated in his NHL debut, but subsequently suffered a knee injury in December which sidelined him until February. Ladd was assigned back to the Lowell Lock Monsters until March, but was recalled to join the Hurricanes for their playoff run. He recorded five points in 17 post-season games helping the Hurricanes to their first championship. The following season, in 2006–07, Ladd solidified a roster spot with Carolina, but underwent an emergency appendectomy on December 14, 2006. He finished the campaign with 21 points in 65 games. During his third NHL season, Ladd was dealt to the Chicago Blackhawks at the trade deadline on February 26, 2008, in exchange for Tuomo Ruutu. He was reunited with three former minor hockey teammates, Troy Brouwer, Brent Seabrook and Colin Fraser, who all played together with the Pacific Vipers. 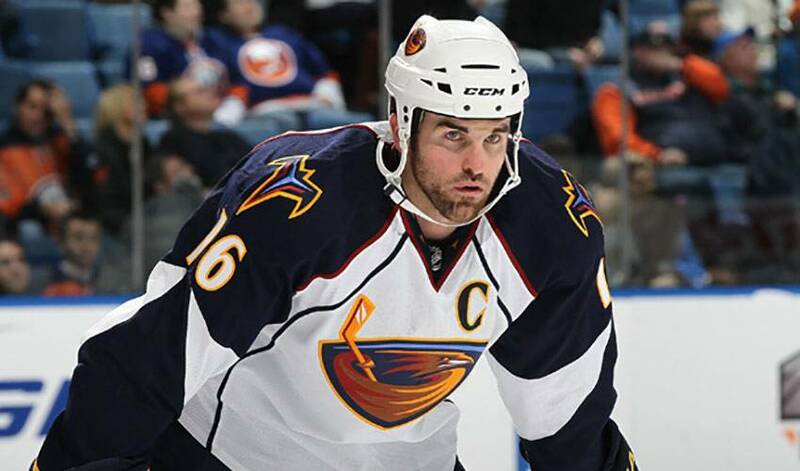 On July 1, 2010, in what was a salary-cap move, Ladd was dealt to the Atlanta Thrashers in exchange for defenceman Ivan Vishnevskiy and Atlanta's second-round choice in the 2011 NHL Entry Draft, joining Dustin Byfuglien, Ben Eager, and Brent Sopel, who had also been traded from the Blackhawks one week earlier. During the 2010-11 season, on November 18, Ladd was named as the captain of the Thrashers, with Byfuglien and TobiHe doesn't need to be reminded he's graduated from raw rookie to experienced veteran. “I'm truly enjoying it,” said Ladd, who is in the midst of one of his best offensive campaigns. “I really didn't know what to expect coming to Atlanta. “I knew I'd be playing a bigger part. And I knew the guys we had would be committed to working hard. Everyone came into the season excited. But it's not just Ladd and Byfuglien who have helped put the Thrashers in the playoff picture and battling for the Southeast Division lead. Tough guy Eric Boulton recently netted his first career hat trick in a win over New Jersey, a moment Ladd and the rest of his teammates couldn't get enough of. Now, all Ladd has left to do is chart out the next big event in his hockey career. The Ladd Foundation supports numerous causes, specifically focused on youth and the environment. The Ladd Foundation, a donor-advised fund, supports a broad range of causes, namely focused on youth and the environment, with an awareness of issues impacting the health and well-being of young people, such as disabilities, illness, mental health and poverty. One NHL Hall of Fame star made Andrew Ladd’s list of Top 5 athletes of all time. Hint: he retired from the game two days after turning 40, and counts the 2001 Ted Lindsay Award among his impressive trophy haul.